The runway is clear, lieutenant, it's time to take to the sky. Wait for my countdown! In 1...2...3...it's off to the clouds and time to fight for your country in this fast-paced, action-fueled WWII battle game. Become the pilot of a top-tier, top-secret mission and help the Allied forces crush the enemy opposition once and for all. The war has gone on for far too long. They bombed London. They took out France. Now it is up to you, brave soldier, to man the heavy gunnery and save the world from imminent destruction and chaos. Piloting an experimental U.S. Navy torpedo bomber you have all the artillery you could ever need to take out Hitler and his Nazi storm troopers. You are the master and commander during the dark days of WWII. Years of combat training have prepared you for this moment. Select war planes based on speed, armor or firepower and then join the battle in the skies. 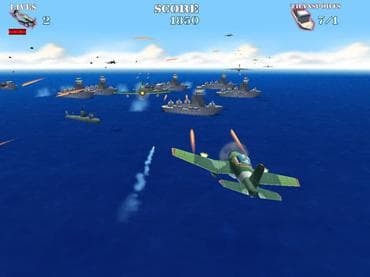 Fly your U.S. stealth bomber over the turquoise water of the Pacific Theater and do your part to secure world peace. State-of-the-art graphics and blistering sound-effects create the ultimate war arena. Download this free full version game and join the fray, soldier. If you have questions about Naval Strike game, please contact us using this form.